Create a cozy outdoor retreat with rich textures and colors that will transition indoors as summer edges into fall. Though we’ll soon bid adieu to summer’s long days and steamy weather, there’s still plenty of time to entertain in style in your outdoor living space. As the air turns crisp, create a cozy outdoor retreat with chic home décor. Think rich textures and relaxed color trends that will seamlessly transition indoors as summer edges into fall. Here are a few ideas to heat up your deck or patio as the nights begin to cool. The Crate & Barrel Outdoor Square Graphite Pouf ($249) offers an impromptu seat or side table for your patio and, later, the living room. Crocheted by hand and made of weather-resistant polypropylene yarn, this pouf’s cozy knit appearance will warm up a room and weather the elements. 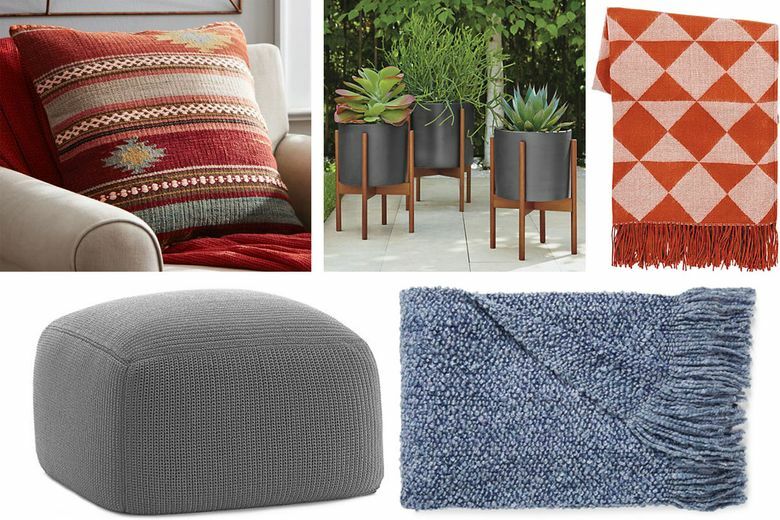 Comfortable throw pillows make lounging outdoors a little more luxurious. Update your outdoor space with pillows that pop, such as the Pottery Barn Penn Stripe Kilim Pillow Cover ($49.50). The rich colors, woven texture and geometric shapes will mix well with a modern or classic interior come fall. Give your plants a stylish home with the Case Study Planter with Walnut Stand ($149–$189 at Room & Board). Made with matte-glazed ceramic and weatherproof Brazilian walnut wood, these elegant planters in two sizes lend a modern touch to greenery both indoors and out. Quickly warm up your seating area with the West Elm Warmest Throw in Triangle Jacquard ($39), featuring bright, bold geometric shapes. Or go for a soft, shabby-chic blanket, such as the Kennebunk Home Camelot Throw ($59 at Nordstrom), to keep your guests cozy. Extend on-trend geometric prints to the ground with the Indoor/Outdoor Chevron Rug ($70–$500 at Target), an all-weather rug in a classic motif. Set an eclectic dining table by layering glass votives in warm colors, like those in the Glassybaby At the Cabin Set ($220 for five), featuring gorgeous colors that will play well with all kinds of home décor. Experiment with indigo — one of the season’s hottest colors — with the Crate & Barrel Zuma Indigo Rectangular Tray ($45) to put a pop of color into your party. 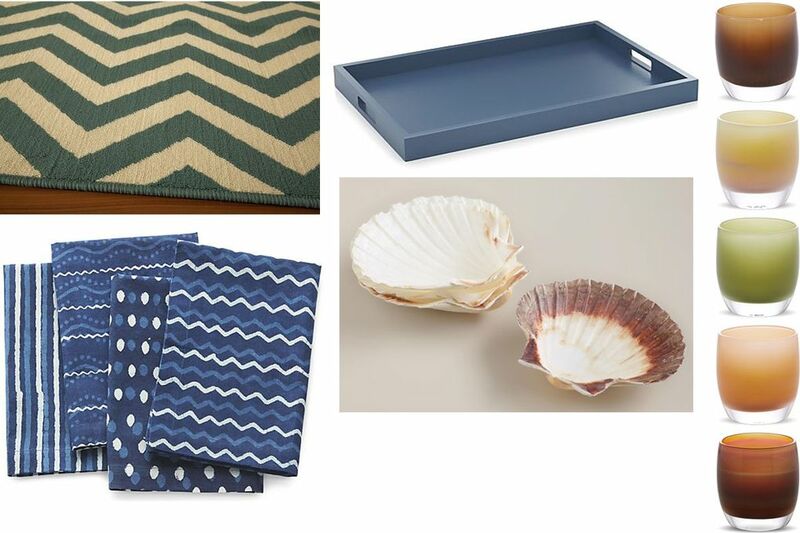 Add the Crate & Barrel Makena Indigo Dinner Napkins ($20 for four), in the deep hue, to create unique table settings. Bring a coastal touch to the table with Cost Plus World Market Large Natural Baking Shells ($5 for four), heat-resistant and reusable seashells you can use to serve hors d’oeuvres or dips. When things really start to cool down, an outdoor fireplace makes it comfortable to remain outside. Store your logs in style with the Rejuvenation Iron Hoop Log Holder ($99–$139), a hand-welded holder with a simple industrial design. At the end of the night, toss your throws and pillows into the durable, indoor-outdoor Colonial Mills Braided Storage Basket ($99 at Nordstrom), which features a lovely pattern and texture to dress up the deck. The right lighting can transform an outdoor space into a second living area. Craft an elegant dining table with Metalwork Hurricanes ($12–$44 at Anthropologie), available in four sizes, lit from within with your favorite candles. Cast a warm glow with Aurora String Lights ($16–$98 at anthropologie.com). Barely noticeable during the day, these delicate, decorative mini bulbs light up a fireplace mantle indoors or can be packed inside lanterns outdoors for a rustic look. 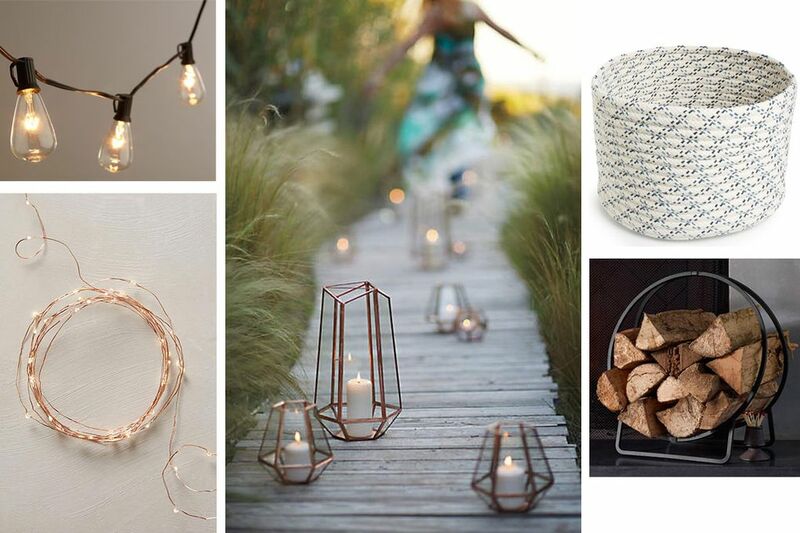 Get European-café style in your backyard with Edison-Style String Lights ($25–$50 at Cost Plus World Market). Strands of these vintage-inspired lights strung overhead add ambiance and make a stylish statement. Once winter comes, move them inside to bring extra light into your home in a modern way.